The Fjord Flyer is issued for the months of September through May, with an extra summer issue. Previously our newsletter was sent to our members as a black and white mailer via post, but beginning in 2010, members were given the option to receive it as a full-color e-magazine! Join our team – Volunteer for The Fjord Flyer! If you like to write, you dream in InDesign, love working in Photoshop, or you review things until every detail is correct, then becoming a part of our fun team is the thing for you! We are always looking for proofreaders, photographers, and writers with a few hours to spare every month. 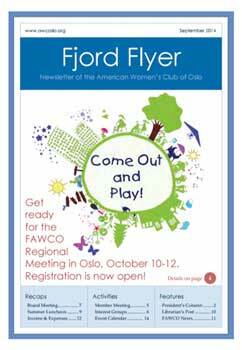 The Fjord Flyer is a newsletter published ten times a year (September through June) by the American Women’s Club of Oslo, a non-profit organization. Our members are primarily Americans or the spouses of Americans as well as international members with a connection to America. Circulation varies between 150 to 250 recipients per month, which includes our members as well as organizations throughout the local community. The Fjord Flyer is a valued resource to our community, as a bridge between expatriate Americans and the Norwegian community. We are pleased to offer commercial advertising space as well as classified ads. If you would like information about placing a classified advertisement in The Fjord Flyer, please contact our Editor at fjordflyer@awcoslo.org.